Kareem Abdul Jabbar vs Bruce Lee / What Color Is My World? Just how Lucians love country & western, they love kung fu. Growing up in St.Lucia ... DBS played kung fu movies every weekend. So this I thought rather amusing, this scene with basketball legend and the NBA's all time leading scorer, Kareem Abdul Jabbar and Bruce Lee. 'Though this post was really to mention this kid friendly book "What Color Is My World? 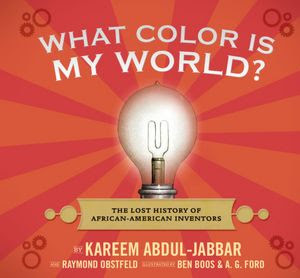 : The Lost History of African-American Inventors" by Kareem Abdul Jabbar. "Did you know that James West invented the microphone in your cell phone? That Fred Jones invented the refrigerated truck that makes supermarkets possible? Or that Dr. Percy Julian synthesized cortisone from soy, easing untold people's pain?